Ghana’s Under 23 soccer team (Black meteors) connected through Nairobi on Thursday enroute to Khartoum-Sudan where they are scheduled to play in the 2012 London Olympic’s qualifier against their Sudanese counterparts. Ghana will be seeking to overturn a 0-1 defeat suffered at their backyard in Accra two weeks ago to resuscitate any chances of qualifying for the 2012 games to be played in London. 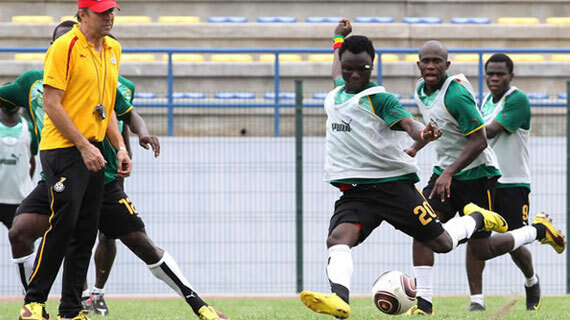 Samuel Inkoom, David Addy, Jonathan Mensah, Daniel Opare, Agyemang Badu, Ransford Osei, Andre Ayew and Dominic Adiyiah were all not present in the first leg of when the team went down to Sudan as they were engaged with the senior Black Stars away in Congo Brazzaville for the African cup of nations qualifier. Ghana could be in for a disappointing crash if they fail to win the return leg match with a comfortable margin in Khartoum. With most of the U-23 players playing in Europe, their clubs are not obliged to release them for the return leg since the date does not fall on a FIFA calendar. The U-23 team had been scheduled to arrive in Nairobi on Tuesday for a two day stop over and light training but their flight was delayed and arrived in Nairobi on Thursday morning. The players later caught a connecting flight in the afternoon for Khartoum.